I’ve been a member of The Modern Quilt Guild through my local Chicago chapter (The Chicago Modern Quilt Guild) since 2010, and just returned home from attending QuiltCon in Austin, Texas earlier this week. QuiltCon is the conference and exhibition created by The Modern Quilt Guild to showcase our guild’s talent, and offer an opportunity for our members to meet in person and learn more about modern quilting techniques. This year’s QuiltCon was an international event and included quilts, instructors, and attendees from all across the globe. If you’ve heard any buzz about QuiltCon yet, you may have seen some pictures of the overflowing swag bags given out to attendees that included fabrics, notions, patterns, and a pretty swank gift from BERNINA in the form of a stitchy watch! 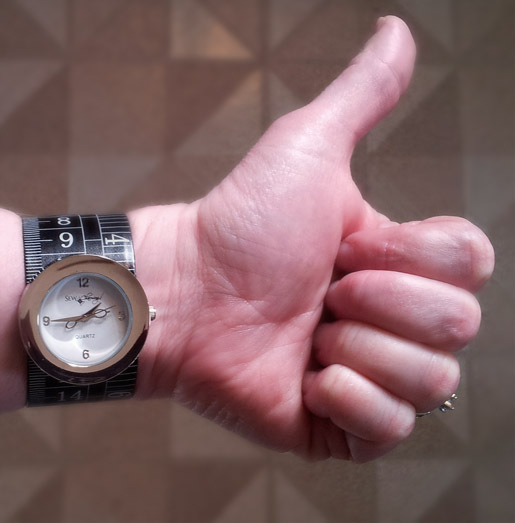 The watch was a big hit! Several of my Chicago Modern Quilt Guild (CMQG) guild mates attended the show along with me, and we all agreed that the quilt show was absolutely amazing this year. There were so many quilts using so many techniques and styles, yet they were all unmistakably modern. Looking at the quilts is a wonderful way to see the current trends and direction of quilting in the modern movement. 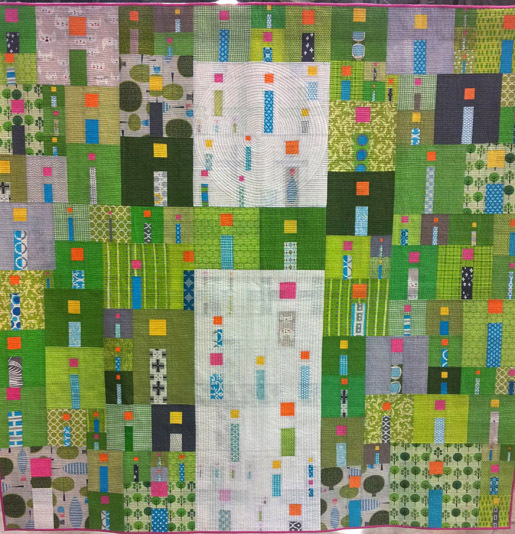 The ribbon for Best In Show was awarded to Kathy York from the Austin Modern Quilt Guild for her i Quilt. Beautifully pieced and quilted, this is even more stunning in person! 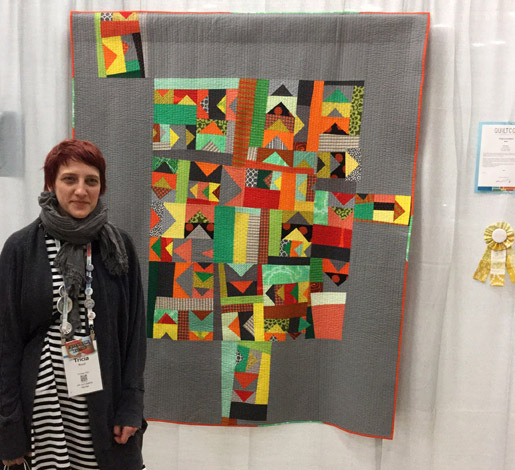 Many of our Chicago Modern Quilt Guild members entered quilts into the show this year, and we were so excited to learn that three of our members won prizes for their work! 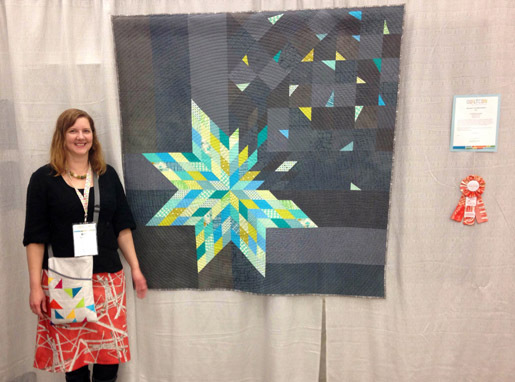 This is Deconstructed Lone Star by Amy Struckmeyer with her quilt (Amy blogs at form*work), winning Second Place for the Modern Traditional category (Photo by Sarah Evans). 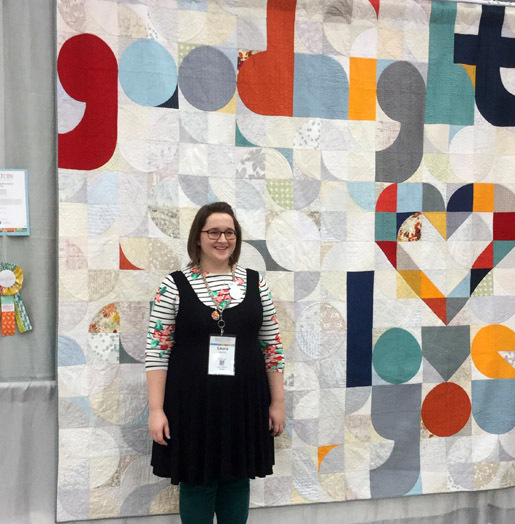 Our CMQG guild mate Tricia Royal (of bits and bobbins blog) is pictured here with her quilt that won Third Place in the category of Improvisational Quilts, This Way (Photo by Sarah Shulman). And our CMQG member Laura Hartrich (of laurahartrich.com blog) poses here with her quilt that won the QuiltCon People’s Choice award, Quilt for Our Bed (Photo by Sarah Shulman). 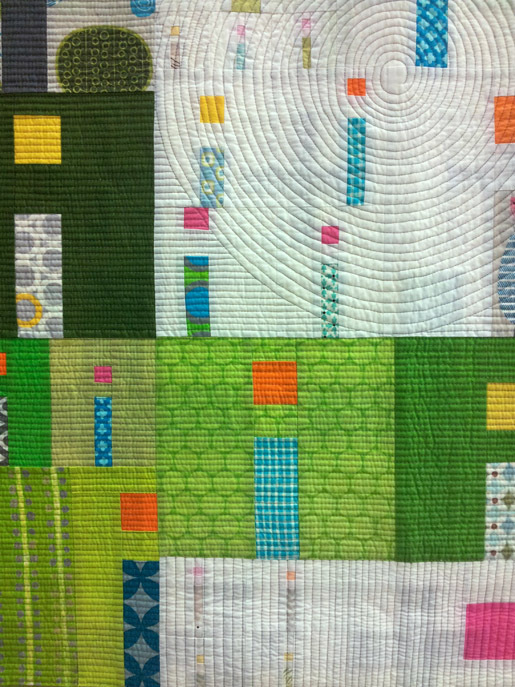 You can check out ALL of the quilts that were awarded prizes at QuiltCon 2015 right here at the MQG blog. While the focus of the event is (as always) modern quilting, this year’s event also included a spotlight on the quilters of Gee’s Bend. The style of quilting originating from Gee’s Bend are created by a group of women living in an isolated hamlet of Gee’s Bend, Alabama. These quilts are predominantly created in a style much different than the orderly, regular geometric designs of traditional American quilts. 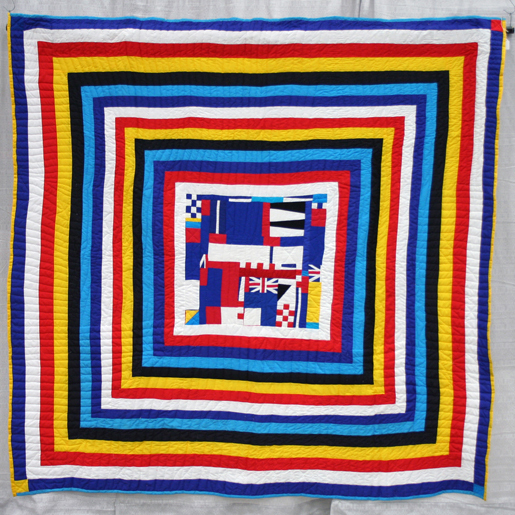 These quilts are lively, full of energy and soul, and were pieced in an improvisational style. Like this quilt by China Petway of the Gee’s Bend Quilt Collective titled, Railroad Crossing (Photo by Emily Bruzzini). To celebrate the quilts of Gee’s Bend, QuiltCon displayed several Gee’s Bend quilts in the exhibition, featured a Keynote Lecture from women of The Gee’s Bend Quilt Collective, and offered the opportunity to learn in class directly from a handful of the talented, soulful quilters. I was lucky enough to snag a spot in a class with the Gee’s Bend quilters, and made a small, improvisational patchwork block. I was excited to be in Sarah Nishiura’s class focusing on foundation piecing. 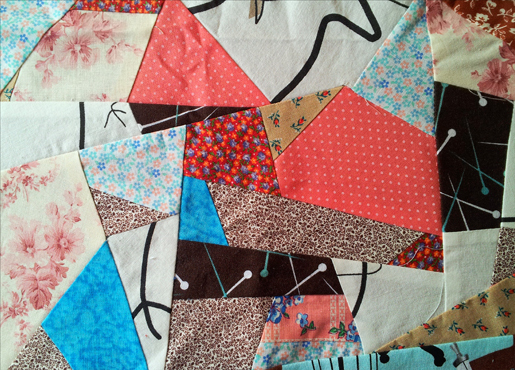 Sarah’s quilts have a strong geometric design yet often also include improvisational piecing within the design. Check out Sarah Nishiura’s quilts at her website. 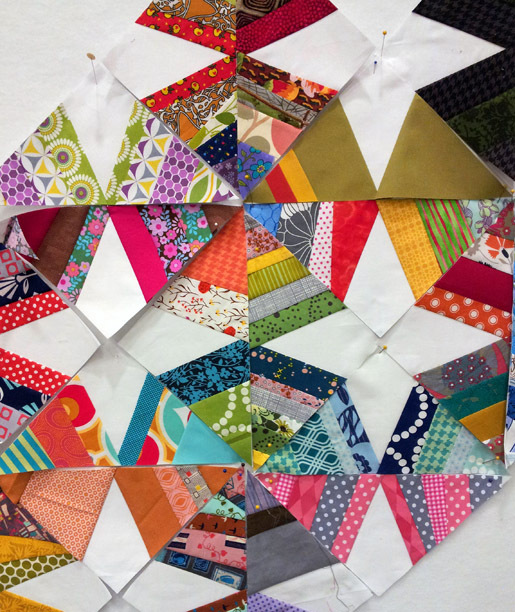 Here’s a few of the samples I made in Sara’s class, a paper pieced spider web block, which started to look like a pattern after we put all of our class samples together. It was a real “Ah-ha!” moment for me to understand foundation piecing. I also was very happy to participate in Penny Layman’s paper pieced pattern class (you may know Penny’s work from her blog, sewtakeahike). In Penny’s class we learned how to take an original sketch or picture and turn it into a paper pieced pattern. 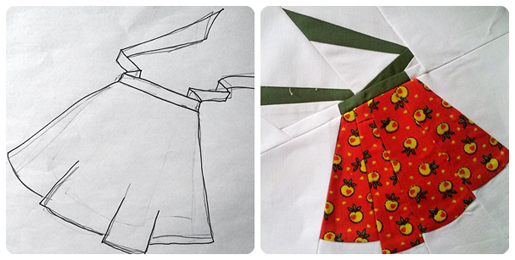 Here you see my quick sketch of an apron, which Penny helped me to turn into a pattern, and that I stitched together in a paper pieced block. Of course I also picked up a copy of Penny’s latest book, The Paper Pieced Home, with a special autograph from the author! 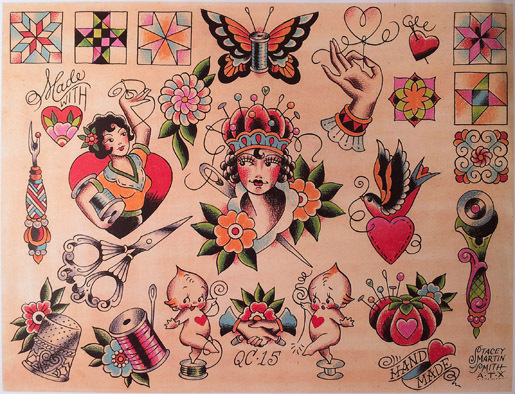 So many QuiltCon attendees included getting a tattoo as part of the very first event in 2013, this year event planners included tattoos as part of the experience! Two tattoo artists were invited to set up and tattoo during the event, Michael Williams from Amillion Tattoo in Austin, and Stacey Martin Smith from Golden Age Tattoos, also in Austin. Stacey designed a set of work specifically for the show, pictured below, that attendees could chose from as a special QuiltCon memento. 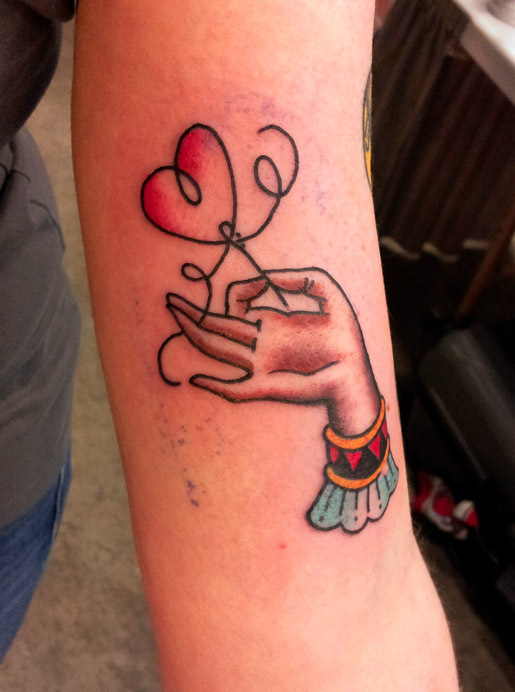 And I chose the very elegant and Victorian looking hand holding the needle and thread that creates a heart. Here it is, just minutes after Stacey finished it, still a little inky – and I absolutely love it! 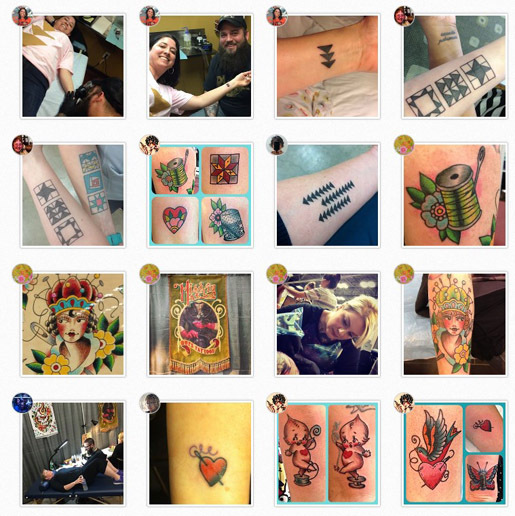 See even more tattoos from QuiltCon by searching for both hashtags #QuiltCon and #Tattoo on Instagram! Some vendor booths were giving away temporary tattoos – see if you can find the temporary tats from the real thing! QuiltCon 2015 was so amazing, and I’m left so inspired from all of the quilts I saw, the lessons learned from the talented instructors, and best of all from the friends both new and old that I met this time around. And you know what? I’m ready to do it all again next year!